Optimum Hyper Spray Compound once again proves Optimum is an industry leader in innovation. Never before have polishes like this come in a spray on form that save you both time and effort. It can quickly remove remove swirls, oxidation and ultra fine scratches for good! It has the cutting power of a medium to heavy cutting polish but it finishes down more similar to a light cutting polish. Generally it should be followed up with the Optimum Spray Polish for best results. After one application you will be amazed at the depth and gloss it can bring back to your clear coat. It can help restore very old vehicles and make even the newest vehicles look better! It can be used on all types of clear coats with outstanding results. It can remove light wet sanding marks, buffer haze and more noticeable surface imperfections. This completely new formula took years of research and testing to perfect with help from one of the worlds largest car manufacturers. The goal during the design process was to create the best results possible in the least amount of time. It utilizes ultra fine micro-abrasives that will not break down and offer excellent polishing power that is safe and easy to use. This one of a kind formula will impress you from the very first application and beyond. 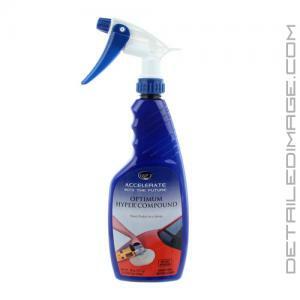 To use it simply spray the polish on your pad or directly on your vehicle and begin buffing. When you spray it on your pad it more evenly coats the pad so the pad is instantly primed and ready to be used. You can even do both by misting it on the pad and the paint for best results. Traditional polishes often leave some parts of the pad dry and other parts of the pad caked up with too much polish. This can cause hazing and other surface imperfections, producing less than ideal results. With a spray on polish you wind up using less product and saving money because it's being spread more evenly. Best of all during the application you'll notice there is no dusting and it works great in the sun or shade. This means less time is spent on removing the excess polish as well. The convenient spray polish is perfect for professionals and enthusiasts alike so everyone will enjoy improved results in less time. Upon completion the paint will look more optically clear and glossy. Try the Optimum Hyper Spray Compound today and you'll see why a world's leading car manufacturer, professional detailers and car enthusiasts alike are loving this product! This ground-breaking spray polish is fast cutting, ZERO dusting, and user friendly. A unique blend of proprietary polymers and abrasives allows for rapid removal of sanding marks and deep blemishes, all while feeling and creating the look of a polish. No chalky residue... EVER. 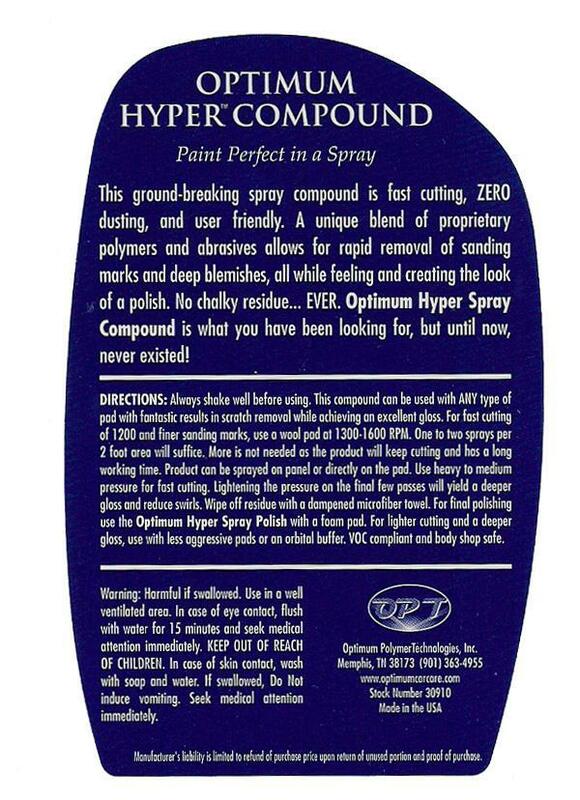 Optimum Hyper Spray Compound is what you have been looking for, but until now, never existed! DIRECTIONS:Always shake well before using. This compound can be used with ANY type of pad with fantastic results in scratch removal while achieving an excellent gloss. For fast cutting of 1200 and finer sanding marks, use a wool pad at 1300-1600 RPM. One or two sprays per 2 foot area will suffice. More is a not needed as the product will keep cutting and has a long working time. Product can be sprayed on panel or directly on the pad. Use heavy to medium pressure for fast cutting. Lightening the pressure on the final few passes will yield a deeper gloss and reduce swirls. Wipe off residue with a dampened microfiber towel. For final polishing use the Optimum Hyper Spray Polish with a foam pad. For lighter cutting and a deeper gloss, use with less aggressive pads or an orbital buffer. VOC compliant and body shop safe. The compound does work, however you may experience marring. If you are a DIY'er don't freak out, make sure you buy Hyper Polish as a companion which will fix the marring. I have a 2015 Nissan Rogue in SuperBlack. Due to rural area and bad water I have to use rinseless wash which results in a lot of swirling over time. Decided to switch to Gloss Coat which has worked really well on the front fascia and back deck. Now working on sides, where the grime results in many swirls - dealer wash gorillas did not help either. Tried various pads (Rupes Yellow and LC orange) but best results came from using Chemical Guys HexLogic pads. H Compound with CG Orange produced alot of marring which fixed with Hyper Polish and CG White pad. Then switched to Compound with CG Green pad which was much less marring, but still needed CG White with HP to finish up. HP with CG Orange also worked on lighter swirls, but again finishing with HP and CG Black pad. The spray feature of these polishes sounds good, but stinks in practice - you can NEVER keep a fine spray coming from ANY nozzel. The product starts drying in the nozzle and on the second spray it's squirty a stream which defeats the spray feature. I gave up and just put "spots" on the pad by turning the botton upside down on the pad - JUST SMALL SPOTs or you'll start spraying polish all over your paint when you start your polisher. Used Adams Polishes 12mm Mini Swirl Killer (sale for $150) which I love - much more quiet and smoother than CG Torq FX, or Porter Cable (both 8mm). Highly suggest that DI carries both the 12mm and 15mm versions of this polisher - for DIY'ers this machine is great and MUCH less than Rupes machines. Makes polishing enjoyable, does all of the work (I never broke a sweat), is quiet, and rugged build. HIghly recommend this whole combination - Adams polishers, CG pads, and Hyper Compound and Polish - you don't need anything else. Tried this for the first time on a couple of vehicles. It works good; in fact, its so smooth and dustless, you have to really be careful you dont go past the place you want to go in removing just enough material for the correction. I need to use it more to get the hang of this product, and I am sure I will be using it more. Recently used it to totally clear out mild scratching on a 2008 Acura MDX with a Graphite Gray Paint, and it literally made the metallic particles in this paint almost "jump out" of the clear coat so good that you wanted to touch them to feel them on the outside of the paint. The only thing I have a problem with is the spray applicator on the bottle - it doesnt want to spray the product out very easily and most of time it splatters out, getting product all around the area you are attempting to spray it on. In my case, I wanted to spray the foam pad; Im not going to try to use it to spray a panel, because I know it will spray too much and get everywhere I dont want it to go. A small amount goes a long way, it has great, long, working time, appears to remove imperfections just fine, and best of all, it doesnt dust hardly at all! You wont be finding even a little amount between door, trunk, or hood seams..